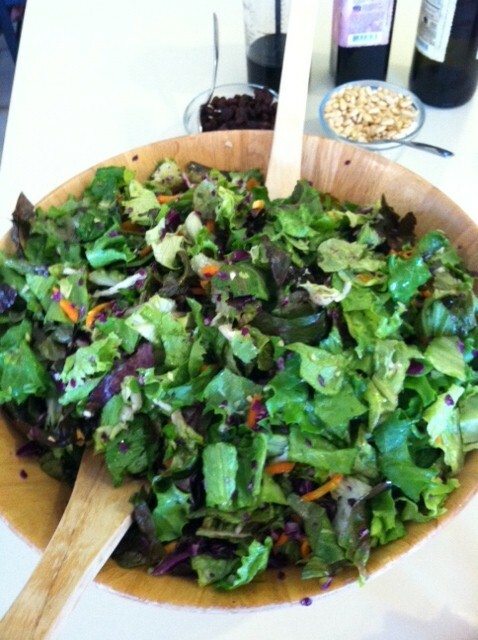 We had a fabulous group this past Monday at Meatless Mondays, a plant-based cooking demo with a luncheon. Here are the recipes we made and enjoyed. Please make comments if you want to add anything or if you tried them. I would love to hear from you! First was the “several-days salad” meaning that if you lightly coat your salad with olive oil, you can keep it in the fridge for several days without going bad. Do NOT add vinegar or salt as it will wilt the lettuce. I learned this valuable tip from Chef Rachel Albert. Add any vinegar, salt and any moist fruit or veg at the time you eat it i.e. avocado, tomato, etc. We put pine nuts, raisins and avocado’s on the side to put on individuals plates because they tend to drop to the bottom of the bowl. Sauté’ onion and oil over medium heat for 4-5min. Add carrots, bell pepper and cook another 2-3 min. 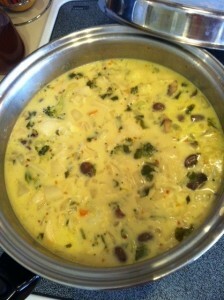 Add mushrooms, cabbage, potatoes, and turnips and cook another 5-6min. Add coconut milk, water, Braggs, lime/lemon, spices, rest of vegetables (broccoli, cauliflower) and simmer 20-30min over low heat. Adjust seasoning as needed. Garnish with cilantro, pepper, and avocado before serving. Add precooked quinoa/rice in bowl for heartier meal. Makes 4 generous servings. Next we made a RAW pecan pie with nuts and fruit. It was a real hit! I like to add some raw dishes to each luncheon. This came from a RAW food prep class I took from Janet Lee in Chandler. Thanks Janet! Soak dates for 20min to 1hr. Combine mac nuts and 10 dates in food processor & some salt. Process until clumping. Grease bottom of 9-inch pie pan with coconut oil and add dried coconut to keep from sticking. Press dates/mac nuts mixture into bottom of pan and up the sides to form a crust. Set aside. Combine remaining dates, cinnamon, salt, vanilla in food processor until mixture has smooth consistency. Spread filling over the crust. 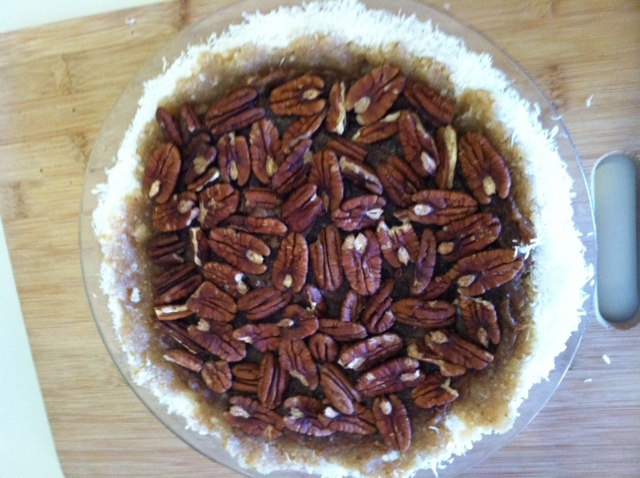 Arrange raw pecans on top and press lightly. Serve immediately or refrigerate. Thanks to all the participants that make these luncheons a success! I added one additional class in March as the luncheons are filling up fast. Both luncheons are full already. If interested, sign up in April! To your health….